When United released their new Bukta designed Home kit for the 1972/73 season, and alternative version was also introduced. Very much a carbon copy of the Home kit, this shirt had an additional thick black stripe down each side of the torso, with a matching stripe down the underarms towards the cuffs. Like the then Home shirt, there was no club badge or manufacturer logo on this shirt - they would eventually appear on the Home shirt at the end of the following season. 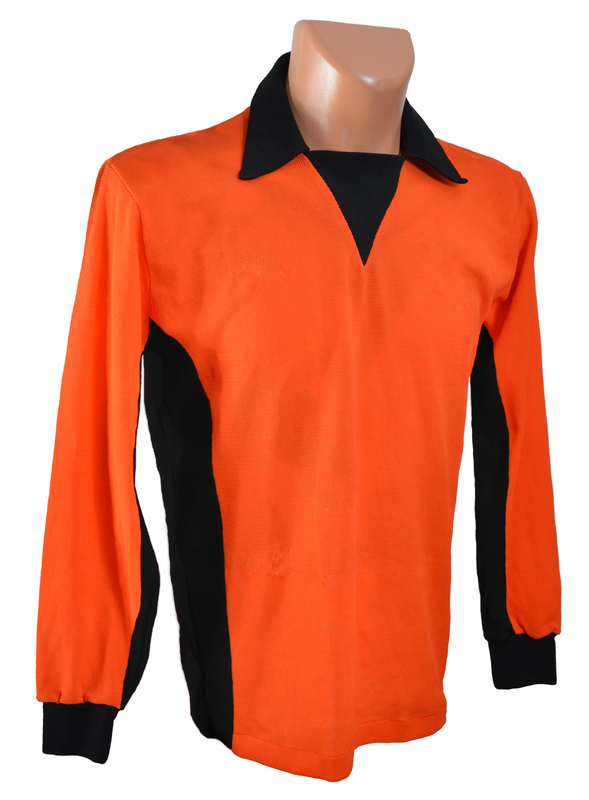 As with the Home kit, this alternative shirt was originally worn with athletics style tangerine shorts with a thin black trim down the sides and around the legs, which were followed by plain tanagerine shorts, and later with tangerine shorts with a thicker black line down the sides. First worn in a Division One match versus Ayr United in October 1972, it made quite a few appearances in place of the usual Home kit, with one of its last appearances being the Scottish Cup Semi-Final victory over Hearts at Hampden Park in April 1974.